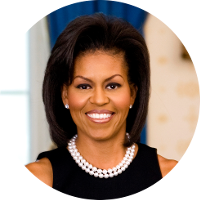 Michelle (Robinson) Obama is the wife of the 44th U.S. President Barack Obama. Michelle was born in Chicago in 1964 to Fraser Robinson III and Marian Shields. Michelle's brother Craig Robinson is the head basketball coach for Oregon State University and the former head basketball coach of Brown University. While it's been well known that Michelle's 2nd great grandfather Dolphius Shields was born to a female black slave named Melvina, what wasn't known until recently was who his white father was. In her book American Tapestry: The Story of the Black, White and Multiracial Ancestors of Michelle Obama, Rachel Swarns reveals the results of DNA tests that point to Charles Marion Shields as being Dolphius's father. Charles was the son of Henry Wells Shields and it was Henry who owned Melvina.